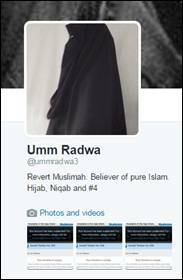 “Umm Radwa” is an Islamist propagandist on Twitter who is a “believer in pure Islam.”Umm Radwa, Twitter account, accessed July 21, 2015, https://twitter.com/ummradwa3. She regularly promotes the accounts of Amal (Bint Rose),Umm Radwa, Twitter post, July 22, 2015, 6:56 a.m., https://twitter.com/ummradwa3/status/623854206466654208. @UmmAysha11__,Umm Radwa, Twitter post, July 22, 2015, 5:37 a.m., https://twitter.com/ummradwa3/status/623834325809639429. and other ISIS propagandists. Her first post on July 20, 2015 under her @ummradwa3 account announced she was “back again after suspension!”Umm Radwa, Twitter post, July 20, 2015, 6:07 p.m., https://twitter.com/ummradwa3/status/623252955559387136. The number of times Radwa has been suspended is unclear, though the “3” in her username may suggest this is her third account. A Twitter search reveals messages directed to the accounts @ummradwa and @ummradwa2, although the accounts have been suspended. 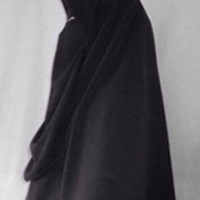 In her Twitter profile, Radwa calls herself a “Believer of pure Islam.”Umm Radwa, Twitter account, accessed July 21, 2015, https://twitter.com/ummradwa3. She calls for her followers to block “kuff,” an abbreviation of kuffar (nonbelievers) she uses for Twitter users who disagree with her. 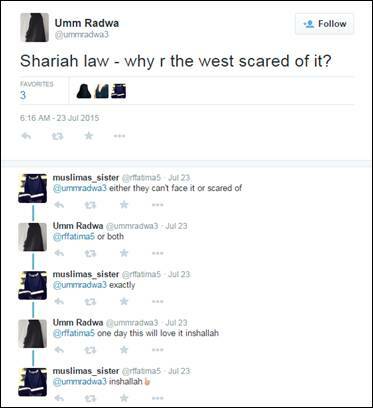 Radwa questioned why the West fears sharia (Islamic law) in a July 23, 2015 post.Umm Radwa, Twitter post, July 23, 2015, 6:16 a.m., https://twitter.com/ummradwa3/status/624206540497498112. In follow-up replies, Radwa agrees with another Twitter user that one day the West “will love it inshallah.”Umm Radwa, Twitter post, July 23, 2015, 6:16 a.m., https://twitter.com/ummradwa3/status/624206540497498112. @ummradwa3Umm Radwa, Twitter account, accessed July 21, 2015, https://twitter.com/ummradwa3. 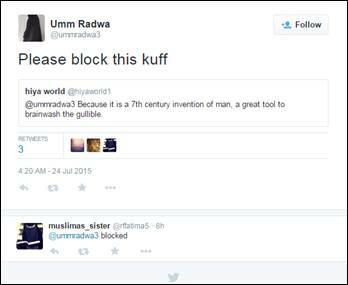 “Please block this kuff [kuffar, or disbeliever]”Umm Radwa, Twitter post, July 24, 2015, 7:20 a.m., https://twitter.com/ummradwa3/status/624539720777752576. “Sharia law - why r the west scared of it?”Umm Radwa, Twitter post, July 23, 2015, 6:16 a.m., https://twitter.com/ummradwa3/status/624206540497498112. “Kuffs [kuffar, or disbelievers] - aargh”Umm Radwa, Twitter post, July 23, 2015, 2:39 p.m., https://twitter.com/ummradwa3/status/623970527468609536. “Back again after another suspension!”Umm Radwa, Twitter post, July 20, 2015, 6:07 p.m., https://twitter.com/ummradwa3/status/623252955559387136. “Without a doubt Twitter suspensions are biased against us. They hate us.”Umm Radwa, Twitter post, July 20, 2015, 9:15 p.m., https://twitter.com/ummradwa3/status/623300202133237760. “@Batboat77 @wschjtd my last account was suspended and I didn't post 1 tweet that was offensive”Umm Radwa, Twitter post, July 20, 2015, 9:25 p.m., https://twitter.com/ummradwa3/status/623302868053852160.